Why Hire Writer Pat Kramer? S pringtime in Southern California is a time of rainfall. 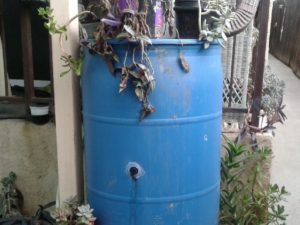 Given that we rarely get any rain in our Mediterranean and desert climate, now is the time to take advantage of it with a set-up of rain barrels and other catchment devices. I have several in my yard which are set up under places where the gutter releases a steady stream of water when it’s raining. 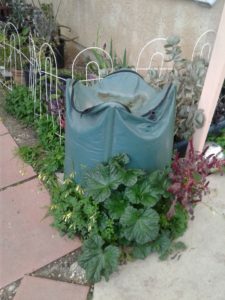 I ordered mine off Amazon.com and utilized the City of Los Angeles’ rain barrel rebate program, formerly available through the DWP website under their Consumer Rebate Program. When I ordered my rain barrels, I received rebates of a certain amount for up to two barrels, although I remember that it took about a year to actually get the rebate. My rain barrels cost me $80.00 and $60.00. You can pay a lot more for a rain barrel at a retail store so I felt this was a good price. Unfortunately, the one that was $6 0.00 lost its effectiveness when I discovered, much later, that it was empty. Apparently, there was a hole somewhere that I didn’t notice. The other rain barrel is still working after three years. 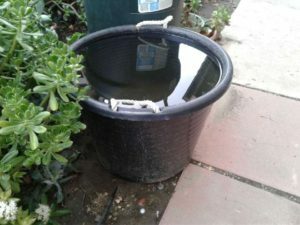 I added a few more receptacle to catch water in my yard and now have them in every corner where I can capture rainfall. I find it very handy to have rain barrels in my front and back yard as I have a pretty extensive garden and my succulents need water more frequently when it’s hot and dry. Having water nearby means I can just open a spout to refill my watering can without having to unroll the hose (which always seems dirty and difficult to manage). If you are going to use your rain barrel for drinking water, be sure to add bleach to it. I’m not sure what the exact proportion is but you can find lots of information online regarding water purification and safety. Another way I conserve water during our drought season is I keep several buckets in my bathroom which I use to bail out water after a shower or bath. In other words, I close the drain when I take a shower and then scoop up soapy water in the buckets and haul it outside to use on my garden. The soap doesn’t harm the plants – it actually helps reduce bothersome insects and keeps my garden green all year ‘round. By having buckets of water in your bathroom or kitchen, you can reduce your water bill greatly and you’ll also become more conscientious about how much water you actually use. I know that after hauling full buckets of water down my stairs , I learned to become more conservative about the length of my showers and the amount I fill the bathtub for a soak. (I used to use eight buckets of water, per bath; now it’s about 4 – 5 buckets). As I mentioned before, I also recycle my dishwashing water, several times a day. The food particles in the water contribute compost to my plants while the soap wards off insects without having to use pesticides. By taking a few easy measures to conserve water and reuse your greywater, you will have an abundantly greener yard without a high water bill. For more information on the DWP’s energy conservation measures, go to: https://www.ladwp.com/ladwp/faces/ladwp/residential/r-customerservices.